In the mid-1990’s I was working as a consultant to the Italian defense firm Oto Melara. Oto Melara’s name was made by its 3” (76mm) naval gun that took the world by storm. Over 100 navies globally, including the United States, adopted the 76mm gun for their corvettes, frigates and patrol boats. 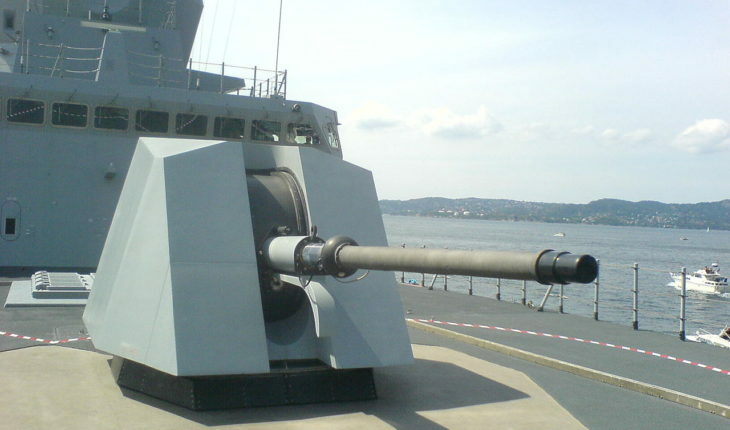 The original Oto Melara gun system fired at around 80 rounds per minute, which was more than adequate against the kinds of threats that were around in the 1970’s and early 1980’s. The gun could be used in naval warfare, and as the Israelis proved very convincingly, also was very effective in supporting ground troops operating near the coast. The range of the gun was quite good, between 16,000 and 20,000 meters (roughly 10 to 12 miles), accuracy was excellent, and a 3 inch round, especially if armor piercing quite destructive. But by the 1980’s the Soviet Union, and later (and even more so) the Chinese started making anti-ship missiles such as the Silkworm, known as the Hai Ying in China (and spawning the HY missile series) and the C-801 and C-802. The Silkworm predecessor, known as the Styx missile sunk the Israeli destroyer Eilat in 1967, the first ship destroyed by a surface to surface missile. Today Iranian fast patrol boats operating in the Persian Gulf and Red Sea are equipped with C-802 missiles. In 2006 the Israeli Sa’ar 5 class corvette, INS Hanit was hit by a C-802 missile (perhaps two of them), causing substantial damage in the aft section of the vessel and costing four lives. That missile or missiles was fired from land and the Hanit was at anchor close to the shoreline. In October, 2016 the Houthis (probably with Iranian support) fired what were probably C-802 missiles hitting the HSV-2 Swift, a ship on loan to the United Arab Emirates from the United States. The ship was being used as a troop transport and supplies ship to help Arab coalition forces in Yemen. The ship was very badly damaged and while it did not sink, it had to be towed after a huge fire on board was put out. There were many casualties. Then, on October 9, 2016 C-802 missiles were again fired by Houthis this time aimed at the USS Mason. The missiles did not hit their target, which the Pentagon attributed to onboard countermeasures on the Mason. The Italian designers in the 1980’s, recognizing that there was a serious and evolving surface to surface and air to surface missile threat emerging, sought to develop countermeasures and looked toward the Oto Melara gun as the first line of defense. This made perfect sense since, for the most part, modern ships were equipped with extremely short range rapid fire system such as the Phalanx CIWS and the 76mm (or larger gun). The first idea was to design a round capable of knocking out a missile, and this was done by inventing a warhead that used zirconium cubes that would disperse around a target and knock it out of the air. But the next problem was linking the gun to a fire control radar and area radar (to anticipate the threat). Otherwise, without tying in the two, the chance to detect and accurately intercept a target was going to be more a matter of luck than anything else. As this work progressed the Italians also noticed that a successful intercept required rapid firing. The problem was compounded as missiles got faster. The early Silkworms flew at around Mach 0.8 or 613 mph. The C-802 operates at Mach 0.9 or 690 mph. 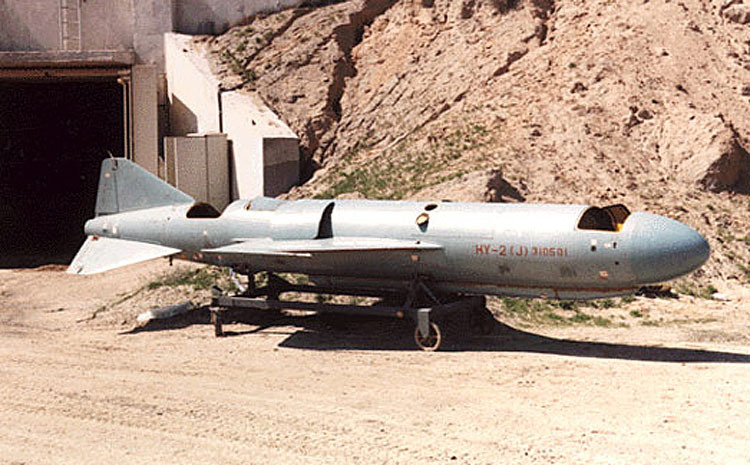 But the HY-3 Silkworm, the most recent model operates at Mach 2.5 or 1,765 mph. In a gun system, as in a ground based missile defense system, the first shot is generally thought to have an accuracy of 70%. But if you can bracket the target, your chance of hitting it goes up to more than 90%. Because the incoming missile is moving very fast, you need to be able to fire off the second round quickly enough to kill the target. Thus, the Italians started by making their gun more rapid fire, raising the 80 rounds per minute to 100 rounds per minute by improving the automated firing mechanism. Next Oto Melara came up with a new version of the gun, the 76mm super rapid, which fires at 120 rounds per minute. Finally Oto Melara developed an entirely new generation of rounds for the gun. The first, known as DART was a missile inside a 76mm gun cartridge. It had two major advantages: it could fly much further than a conventional round, and it was more accurate because of its aerodynamic design and the fact that it could maneuver, something a conventional round cannot. This was followed by an even more potent round called the 76 Vulcano (there is a much larger 127mm version too). The 76mm Vulcano has a published range of 40,000 meters (around 25 miles) and is a more successful implementation than the U.S. attempt to build the ERGM, which did not succeed. Why is a gun needed today since there are other countermeasures available including missiles that can intercept an incoming target? Firstly, many navies do not have either missiles or electronic countermeasures. This takes into account probably 80% of all naval platforms on the seas today. Secondly, it is much easier to upgrade a gun system (including sensors) then to install a completely new system that will tie up a vessel for some time and require considerable engineering. Thirdly, while missile defense systems are important, a ship with perhaps 6 or 8 defensive missile rounds will very rapidly run out of air defense missiles and be compelled to rely on CIWS. 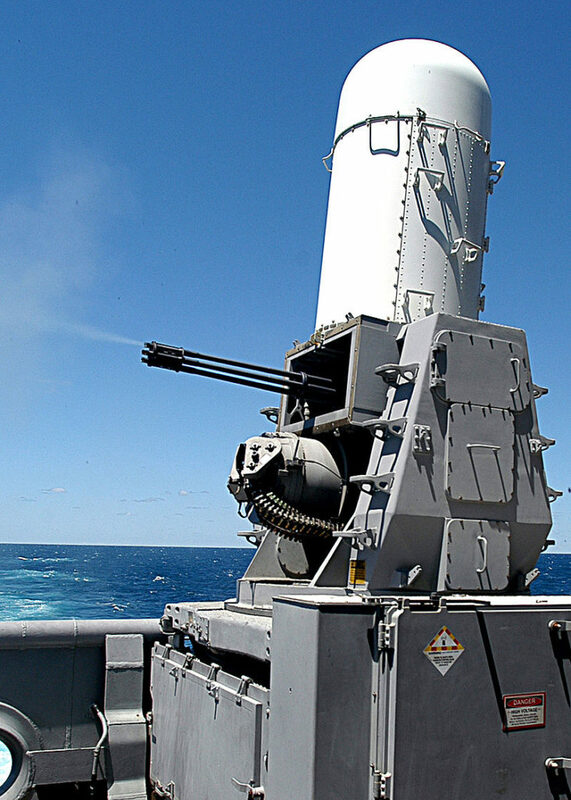 The CIWS system, as noted has limited range and relatively poor kill ability. It is a hope and a prayer system at most. Fourthly, CIWS is not (yet) well integrated with other defensive systems, a shortcoming that further limits the use of CIWS in real combat conditions. Fifthly, the Navy’s experiment with an unproven 57mm system it is buying from Sweden and in use on the Littoral Combat ship may be a major and non-recoverable blunder. The 57mm system is an air cooled gun with modest range, although it does have fragmentation-type rounds. According to at least one unpublished source, the gun can fire for only 7 seconds before it has to stop and cool off. This may be OK against a single target, assuming that the gun’s accuracy is good. But it a second round of missiles comes in 10 seconds after the first, the gun won’t work. If this is accurate information then the gun is very limited in real combat situations. 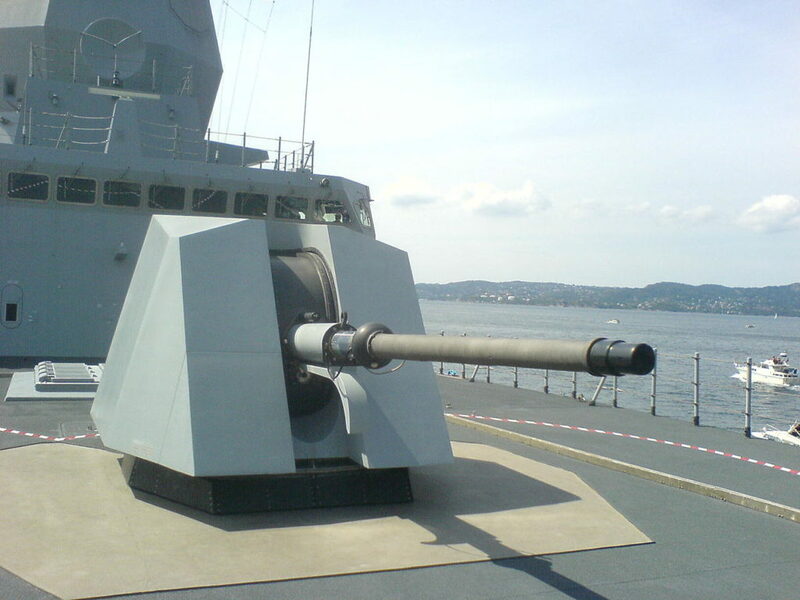 Back in the 1990’s when I went to talk to the Navy about the improved 76 gun system, the Navy told me they were no longer interested in gun systems. Later, around 2005 when I headed Finmeccanica North America, we presented the DART system (and the 76mm Super Rapid) to the Navy. Once again they were not interested. To me, at least the U.S. Navy should reconsider the matter. Having spent $2 billion on the failed ERGM system, and again close to another billion on a more limited substitute, it is time for the Navy to realize that our foes have lots of missiles, courtesy of Russia, China and now Iran. America needs to beef up its naval armaments, and the quickest way to do that is with a long range rapid firing gun system capable of knocking plenty of them out of the air. *Full disclosure. I am not a consultant to nor an employee of any company manufacturing gun systems or components for gun systems. As noted, I previously served as a consultant to Oto Melara in the 1990’s and later as the President of Finmeccanica North America until 2011 (now Leonardo).